Kevin Richardson is the Senior Producer in Nickelodeon’s Kids and Family game unit in San Francisco. He’s spent an equal number of years in the animated film/advertising business, and in games. 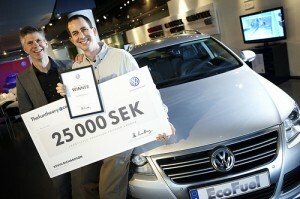 Last year he won Volkswagen’s Fun Theory Award for his idea ‘The Speed Camera Lottery’. The basic question was “Can we get drivers to slow down through fun?” The following is his story and thoughts on the experiment. I’m an outdoors guy who picked, for some unknown reason, an almost entirely indoor profession. To honor the other side of myself, I’ve scoured my brain for ways to combine my love of the outdoors and game making. Ghost Town Mysteries: Bodie, was my first endeavor to combine these two passions. Playing ghost-story-hunter in real ghost towns (like Bodie) led me to travel and shoot photos at ghost towns in remote places and play to my desire of being on some kind of adventure while working. Some people travel to write books or articles. I travel and make games. About a year and half ago I learned about The Fun Theory. The Piano Stairs YouTube video was circulating around the office and really intrigued me. After watching the experiment, where they demonstrated that more people would take the staircase than the escalator if it were FUN, I visited their site and learned that there was a competition to choose the next experiment. “Can you change human behavior for the better through fun?” was the challenge. This was another great opportunity to combine game design with the outside world. Designing for the real world does have its pros and cons. It’s the opposite of what most designers want – some design criteria and some limitations help focus designers on the task at hand. There need not be a points system, trophies, badges, or leaderboards, or even anything to click. The world is already in 3D, so no glasses, shutter or otherwise, are required. No monitor. No need for virtual reality, it is reality. The world is a huge canvas, with endless gamification possibilities, unlike a flat computer monitor. To the annoyance of my wife, I stayed up late that night and thought about the things I believe are wrong with the world and how I could change them through fun. I’ve been haunted for years after witnessing three children struck by autos, and I wondered if there was anything I could come up with to get drivers to slow down. We’ve had speed camera lights at intersections for years, but they don’t really work. I also am against robotizing law enforcement and am acutely aware of the possibilities of unintended consequences from bad design. For example: city managers are shortening the length of the yellow light to increase the likelihood of a motorist getting caught by speed cameras, perversely making driving less safe. Current cameras also cause accidents because they make drivers overly cautious, sometimes causing them to slam on the brakes when it’s unsafe to do so – principally to avoid a ticket. And, if that weren’t enough, cameras are frequently operated by a company in Arizona (I’m in California), owned by a company in Australia. We are exporting our hard earned money, and importing tons of misery. Speed cameras aren’t going away so how can we change them? Can we make driving the speed limit more fun? Can we make this a FAIR system? How do we take the profit incentive away so we can focus on safety? One troubling observation is the obscene amount of energy that goes to the one bad driver who speeds. Police, courts, fines, traffic school, points, increased insurance, and on and on. And where is the reward for people doing the RIGHT thing? What happened to that? Obeying the law is a pretty lonely endeavor. So the way my idea works is simple: Photograph everyone. Fine the Speeders. Give money back to those that obey the law. No drama. It’s fun. Its fair. it’s local. My take away from this gamification experiment is this: Take the thing you want to gamify at face value. Identify what’s making it frustrating, boring or otherwise not fun and decide how to remove these problems. Work backwards from the result you want. Design for that. Get results through positive feedback aimed at the things you want the player to do, and minimally if at all on the negative. Focus on the FUN. There are very few things in the world that can’t be made more fun in small or large ways. Computers are not required, only your imagination, and tapping into our most primal of all desires, which is to enjoy life and play. Watch children. Remember what it was to play as a child and try to bottle that in your design.